An igus energy chain system has recently been designed into the largest capacity rail traverser in the UK. Built by heavy rail lifting manufacturer Mechan Ltd, the traverser moves freight locomotives between eight lines at the Port of Felixstowe’s new North Rail Terminal. With its pivotal role within the port’s rail network, the traverser’s reliability is paramount, while its environment presents a number of challenges. 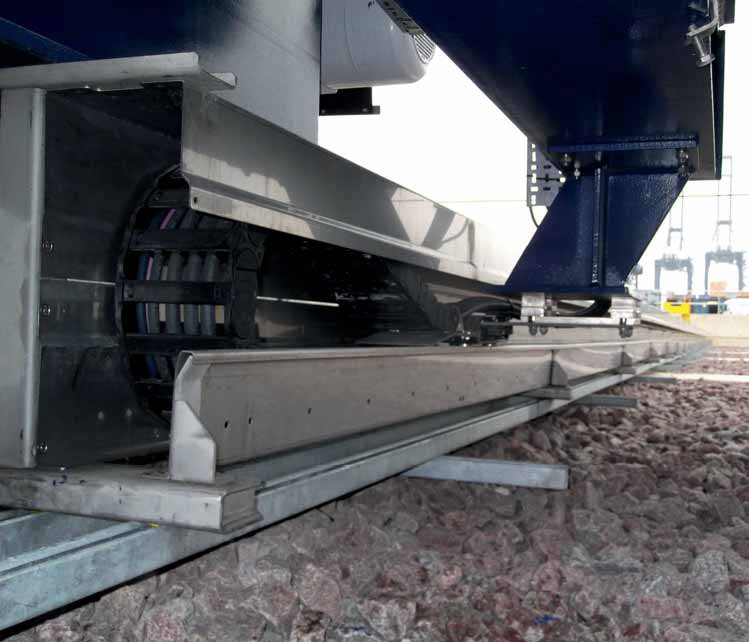 The traverser has a capacity of 170 tonnes, weighs 90 tonnes and measures 30 metres in length. It runs on eight wheels, six of which are powered each with a 15kW electric motor; the entire motor set being fed by a 200A 415V three-phase power supply. The traverser also has an on-board PLC (programmable logic controller)-based system that monitors the status of the traverser’s sensors and activates lights and signals accordingly. It can also activate wheelstops, which prevent a locomotive overrunning the traverser’s rail track. The power to the motors is not controlled directly by the controller. Instead, the PLC transmits data via a Profibus field bus to a ground-based control and switching unit, which acts on the Profibus data to switch power to the electric motors. Therefore, the motors’ power cables, the Profibus data cable and an emergency stop cable must be routed between the moving traverser and fixed ground station. This requires a cabling installation that can reliably withstand repeated flexing during continuous 24/7 operation in an extremely challenging outdoor environment. After deciding that energy chains offered the secure and reliable comms network needed, Mechan turned to cable carrier specialist igus. Mechan took advantage of the project-oriented design, build and installation capability of igus to obtain a complete, installed energy chain solution — and igus certainly had to call on its specialist experience and expertise to overcome the challenges presented. At 30 metres, the energy chain’s size was no problem, as igus has previously installed chains of up to 615 metres. Instead, the issues related to the environment, and to some practical aspects of the installation. The environment was a concern because of several environmental factors. As Felixstowe is a marine port, its rainfall has a high salt content and is corrosive, while protection from wind-born debris was also necessary; freedom of movement could be impeded by a build-up of debris. Also, in winter, freezing temperatures and ice are encountered and the robust design of the system allows this to be overcome. The installation challenge was that the concrete bed for the traverser rails had protruding plinths at eight-metre intervals, preventing any cable trough being laid directly along the length of the main bed — yet a suitable trough would need two-metre fixing centres to allow a fast and robust installation. Installing an I-beam to provide mounting points was also not an option as this would have interfered with the traverser travel path. The igus project team’s response comprised a customized FLIZZ® covered trough system. The FLIZZ is manufactured from stainless steel to provide corrosion resistance, and contains an E4 gliding e-chain®. This energy chain carries a set of chainflex® power and data cables with special properties to survive many flex cycles, high speeds and accelerations while offering EMC safety and compliance with relevant standards. The complete solution, including the FLIZZ, E4.1 e-chain and chainflex cables, was installed by igus into the traverser. Steelwork comprising unistruts and braces was designed, manufactured and used by igus to mount the system to the concrete while clearing the plinths. Based in Northampton in the UK, and with global headquarters in Cologne, Germany, igus is the largest producer of injection moulded polymer bearings and reinforced plastic cable carriers in the world. Product lines include industry-leading e-chain cable carriers, chainflex continuous-flex cables, iglidur plastic plain bearings, igubal spherical bearings, drylin linear bearings and guide systems. The company has 26 subsidiaries across 31 countries and employs more than 2150 people worldwide. Selecting the correct design of gearbox for your application can be a crucial decision that will affect performance, efficiency, reliability and cost. So, having a good understanding of the basic principles and suitable applications is essential. Dave Brown, Sales Manager at Brevini, offers some technical guidance. Gears have been in use since the times of Archimedes and Aristotle, and they continue to play an essential role in mechanical systems across the world. While the basic principles remain the same, the technology has advanced considerably; with different gear arrangements offering a variety of benefits for the right application. A gearbox is most commonly designed to provide a reduction in speed from a prime mover, such as an electric motor, and deliver the necessary speed and torque for a particular application. The gear ratio is the relationship between input and output speed, with output always defined as unity. In simple terms, three revolutions of the input shaft will produce one revolution of the output shaft. lifetime and maintenance requirements. The type of gear arrangement is defined by the design of the gear teeth and how they mesh together. The most basic type is the spur, or straight cut gear, which has teeth that are parallel to the axis of rotation. This design offers economical performance and is equally good for both high and low ratio applications. The spur gear can also be used in combination, or multiple stages, to achieve high gear ratios. However, the straight cut design means that the point at which the gears mesh occurs along one tooth at a time which can cause increased wear and noise, especially at higher speeds. The noise is caused by the single point of contact between the drive and driven gears at the start of gear mesh. This is in contrast to the rolling or sliding type of contact associated with other gear technologies. A refinement of the spur gear is to slant the teeth in relation to the axis of rotation, which allows a more gradual engagement of the meshing teeth for multiple teeth to be engaged simultaneously. This provides a smoother motion with reduced noise. This design has a greater tooth contact area, which increases the amount of torque that can be transmitted by 10–15%, while still maintaining very good efficiency. However, the design of a helical gear induces axial thrust in the gearbox that has to be accommodated either by installing thrust bearings or changing the gear design to incorporate twin helix stages, which will counteract the axial forces, or a more complicated double helix gear. This is a gear with the teeth set in a herringbone arrangement — but this design of gear is more complicated to manufacture as well as assemble and so will carry a price premium compared to the spur gear. So far, the gear arrangements have transmitted power in parallel axes, but a common requirement is to redirect the rotational axis by 90o, which usually involves bevel gear sets or worm drives. The latter have seen significant improvements in efficiency, especially for reduced torque applications at lower ratios and they can still represent good cost efficiency in some applications. The orientation of the teeth in bevel gear sets can be straight cut, but the more common style is a spiral cut gear which offers improved noise levels and efficiency. The most common styles are Gleason or Klingenberg and in terms of costs, the spiral bevel gear option becomes more attractive when the application requires more than 7.5kW with a ratio above 20:1. The final main group of gear arrangements is the planetary gearbox, which takes its name from the normal gear arrangement consisting of a central sun gear, the orbiting planet gears and the outer ring gear, or annulus. By splitting the loads through multiple contacts between the planet gears (typically 3), the torque capacity of a planetary gearbox is very favourable against other solutions. Additionally, the symmetry of the design means that most of the gear separation loads associated with other solutions are self cancelling in the planetary design. These factors combined mean that the planetary solution can be significantly more compact and more cost effective in many applications. The benefits of the planetary gearbox can be combined with a bevel or helical gear system which then offers the benefits of both designs. This enables the advantages and benefits of the different technologies to be combined to optimize the solution for the demands of a specific application. This type of compact gearbox is common in many of the heavier industries where reliability, efficiency and total cost of ownership are important factors. Many factors influence the design of a gearbox for a particular application. The key is determining as many of the crucial factors as possible before the selection process begins. Specific information regarding the reduction ratios, input speed and torque are critical. However, it is also important to define the real duty cycle for the equipment, defining frequency and details of the start/stops, variations in the running torque and speed, and so on. Only with a full duty cycle can you accurately select and design a solution that will perform for the required life of the machine. The location of the application is also important as the design may have to consider ambient and environmental conditions, space requirements, mounting arrangements, weight, noise and maintenance requirements. In addition, the backlash, which is the space between two meshing gears may need to be specified for particular applications. Every gearbox will have some backlash designed into it, to allow lubrication of the gears and prevent the gearbox from locking up. Finally, there are the more specific design characteristics such as shaft alignment, efficiency and expected lifespan, which can influence certain design choices. Having gained a basic understanding of the more common gearbox designs, it is possible to appreciate the alternatives for a particular application. The next step is to discuss more specific requirements with design engineers who specialize in this field. Brevini has always used experienced technical sales engineers to assess each unique application to offer advice and technical knowledge in order to help customers define the correct gearbox for every application. Brevini UK headquarters are located in Warrington, Cheshire, at the heart of the motorway network. Its facilities include 900m2 of offices, manufacturing and warehousing for the Brevini products in Warrington and 800m2 of offices and manufacturing for the PIV Drives helical products in Scunthorpe, Lincolnshire. Brevini UK has enthusiastic staff with long experience in power transmissions and the company offers a ‘solutions based’ approach. Using advanced software, its engineers are able to select gearbox units to last the machine’s total design life. Its UK stock of standard parts, thanks to Brevini’s modular construction, allows short lead times for a larger number of variants and sizes. All of these units are supported by extensive UK technical expertise. Rob Dumayne, Director at igus, reviews the latest developments in plastic bearings, and how industrial manufacturers can use them to produce cost savings while increasing their environmental credentials. The history of the plastic plain bearing goes back a long way, spurred on by the discovery of the lower friction properties of nylon in around 1860. But in the last few decades, the composition of plastic materials has been refined considerably; in the last 30 years igus has developed 35 different tribologically optimized materials, which offer a lower coefficient of friction than conventional metals or composite materials — from the economical iglidur G all-rounder to the FDA- conforming iglidur A180 material. In addition to being lubricant-free, plastic bearings are maintenance-free, impervious to dirt, water, chemicals, heat and shock loads; and because they have essentially the same dimensional structure as conventional bearings they are relatively straightforward replacements. The base of each polymer bearing is, depending on specific requirements, a carefully selected and blended thermoplastic matrix material. To increase the compressive strength of the bearing, reinforcing fibres are embedded within the material during the moulding process, as well as solid lubricants that optimize resistance to wear and reduction of friction. The solid lubricants are very important for the dry-running performance of bearings between the running surface, usually a shaft and the bearing, where they sufficiently lubricate the immediate area. The great advantage of this type of homogeneous construction is its lack of layers; during the transition to the next layer, there is a distinct change in material properties which can cause wear with traditional composite bearings, this usually means the end of the bearing, since the huge increase in rates of friction and wear lead to catastrophic failure.With an injection-moulded iglidur plain bearing however, this does not occur, and the friction and wear rates are constant over the entire wall thickness and therefore life of the bearing. igus self-lubricating and maintenance-free plastic plain bearings are today replacing millions of metal bushings that require oiling or greasing. They increase the safety of the machinery, reduce costs and protect the environment; and because igus rigorously tests it plastics continuously — over 8,000 tests per year for durability, friction and wear — their lifespan can be reliably predicted. igus’ online tool, the ‘Product Finder’, helps engineers find the most appropriate iglidur polymer material that matches specific requirements (highest service life in dry run operation, dirt-resistant, vibration-dampening, resistance to chemicals, good for edge pressure, etc) and state the allowed static surface pressure, as well as upper and lower temperature information. Every year igus develops many new and innovative plastic bearing materials; this interdisciplinary research involves mechanical engineers, materials scientists, physicists and chemists working closely together to meet industry demands. By investing in plastic bearings, engineers can reduce production and maintenance costs whilst their equipment and machinery operate with total reliability in a more environmentally-friendly way. With plastic bearing experience since 1964, cable carrier experience since 1971 and continuous-flex cable since 1989, igus provides the right solution based on 100,000 products available from stock with between 1,500 and 2,500 new products introduction each year. LUBRICATION-FREE PISTON RINGS AVAILABLE IN NEW DIMENSIONS Where PTFE tapes have to be expensively customized and fitted, the iglidur piston rings from igus can be simply clipped on the piston or bolt.This affordable option from igus is now available in a variety of sizes and materials. Whether in driving elements in the packaging and medical systems or in construction and agricultural machinery, the lubrication-free piston rings from igus have proved successful for years.The igus customers can select from the entire iglidur catalogue range with 45 different materials and even configure their piston ring themselves. Particularly predestined materials here are iglidur J350 for high- temperature applications, the FDA-compliant iglidur A180 or the wear-resistant all-rounder iglidur J.These are also available now from stock in 24 special piston ring sizes. The clip-on piston rings allow long-term use without external lubrication, maintenance or replacement of the polymer rings. Where PTFE tapes have to be punched in a complicated procedure and assembled in several steps, the piston rings from igus are simply clipped onto the piston rod or in the housing, they can be pushed to the desired position and already have the piston ring captively mounted and the assembly of the entire unit can continue. The iglidur piston rings are suitable for linear and/or rotary and pivoting movements and are ideal not only for “clean” applications in medical and packaging technology, but also for “rugged” applications in construction or agricultural machines due to their freedom from lubrication, chemical resistance and corrosion resistance. By their low cost and durability, they are a cheap alternative to PTFE tapes. One of the largest chain and bucket elevator projects ever undertaken by Schenck Process and Redler has been recently completed and despatched ready for export and installation overseas. The multiple quantities of huge elevators are for the use in the transportation of fertilizer at high capacity rates within the port and required the manufacture of bulk materials handling equipment that was significantly outside the normal operating design parameters. The specialized design utilized the extensive knowledge and expertise that the company has developed in the handling of bulk materials within the grain and heavy process industries around the world. The project has been co-ordinated from the company’s Stroud based mechanical conveying office and production facility which includes the detailed engineering design, manufacture and assembly of the terminals and components to a very exacting customer specification. The project illustrates the flexibility and capabilities of Schenck Process to provide tailor made chain and bucket elevator or belt and bucket elevator solutions for a wide number of industry applications that complement the Redler branded mechanical conveying and elevating product range that has been provided by the company for over 90 years.